The amount of 1.22 USD has been deposited to your account. Accounts: U12935665->U4035392. Memo: API Payment. 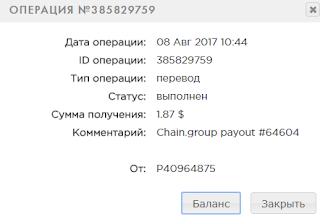 Chain.group payout 66497.. Date: 11:46 09.08.17. Batch: 184533995. The amount of 2.19 USD has been deposited to your account. Accounts: U12935665->U4035392. Memo: API Payment. Chain.group payout 71894.. Date: 07:44 12.08.17. Batch: 184788705. The amount of 1.77 USD has been deposited to your account. Accounts: U12935665->U4035392. Memo: API Payment. Chain.group payout 73763.. Date: 03:08 13.08.17. Batch: 184854752. The amount of 6.56 USD has been deposited to your account. Accounts: U12935665->U2917300. Memo: API Payment. Chain.group payout 76458.. Date: 16:34 14.08.17. Batch: 184990035.